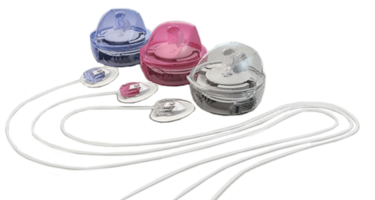 The Mio is a soft cannula all-in-one set that comes complete with an integrated insertion device. The straight 90° insertion angle of this set is best suited for children and adults of average to heavier build. Set and inserter are integrated in an all-in-one unit for convenience. Practical for on-the-go users - the rigid box can be carried anywhere. At-a-glance site inspection via the clear window in the set. Convenient at-site tubing disconnection. Automated insertion with integrated infusion set and insertion device. Straight angle Soft tapered cannula.